A recent article in one of our favorite publications, since we did build the Southern Living Dream Home, got us thinking. Is it really time for a resurgence of the wall? We know they come in handy when defining bedrooms, baths, studys and such, but could it be making a come back in separating dining, living and kitchens as well?! We decided to take a look into it and make a case for both sides. Open Floor Plans…… we’ve got plenty of them! Almost every home we have built in the past 5-7 years is a completely open floor plan. With basically one large room that houses the kitchen, living, dining spaces with maybe a wall or two around a study or play area. 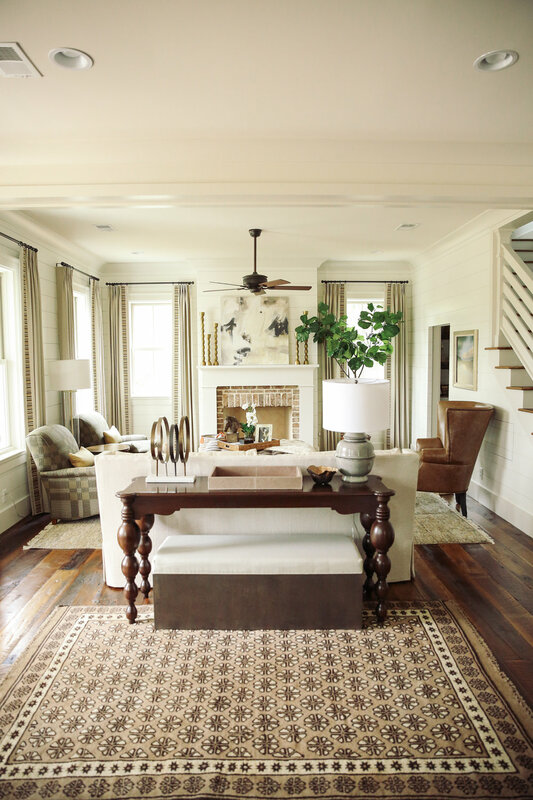 The spaces are defined with furniture, trim, paint or lighting. This allows for free flow and inclusion of everyone no matter what they are engaged in, whether working, watching TV, reading, eating or cooking, everyone can interact. Most love this ability to be involved with conversations or watch TV themselves while cooking and serving meals. It also helps many people feel open and welcomed in spaces that don’t have walls and one can see through to the yard or just into most rooms. Parents also find it ideal so they can keep watchful eyes on little ones as they carry on about their adulting. No wonder this trend has been sticking around for years, feeling invited and included is important to guest and family alike. Feeling invited and included is important to guest and family alike. Which truly does make so much sense. Sometimes you just want to be able to close a door, whether to not see a mess or to block out sound from a TV of kiddos you don’t necessarily want to hear. We recently had a client who loved to cook, a chef’s kitchen was one of her most important features and one she wanted to put a large amount of their budget into. She also loved to listen to music and concentrate while she prepared meals as it was her “me time” and she enjoyed this process so much she wanted to savor it. But her husband loved sports and TV was important to him and a fully open floor plan would’ve been detrimental to this relationship as they both would be unhappy to not be able to fully enjoy what made each of them happy. Walls can be good and there are lots of ways in which to use them creatively as to not make the space feel confined and closed in and not welcoming. We are here to help! That’s why our new design phase process takes you through your WHY and helps navigate and produce a plan that makes everyone overjoyed with their dream home! We absolutely LOVE walking our clients through this phase and coming up with solutions in design that will work for the whole family! What are your thoughts? Open or Not SO Open?! That is the question! Look out 2019….The new design trends are in!